Many children love to make up stories, but how can we capture these examples of their wonderful imaginations when they are too little to write them down for themselves. One way is to encourage them to tell us the story slowly, one line at a time so we can write it down for them. Writing the story down serves several purposes in addition to simply recording for posterity this part of their childhood. When you take time to write down your child's story, you are also taking time to really listen to it, which is something we can easily get too busy and distracted to do as often as we would like to. Really listening and writing down their words gives children a real sense that you value their creativity and it teaches them to value it themselves. It gives children an immediate grasp of why literacy is important and wonderful because they can see that the thoughts in their heads are turning into something that can be shared again and again. On Saturday Ollie and Toby shared an early Easter egg and Ollie immediately was fired up by an idea for a beach picture using the wrapping. He got his scissors from the drawer and asked for card and glue, then I sat down with him and joined in sticking on the wrapping where he wanted it. He then started telling me about a snail who lived on a rock on the beach, so I got a pen and began to jot down what he told me. As we went along I picked out certain words for Ollie to have a go at writing by copying what I wrote for him. He wrote 'snail', 'cabin', 'ship' and 'sea'. He wanted to write the whole story himself, but by giving him a few words to try it gave him a sense of involvement in recording the words. When I ran out of space on the page I wrote it out again neatly on a piece of card, added the title Ollie came up with on the other side of the card and taped the story to the picture. I use Scotch tape for things like this because it doesn't go brown and peel off like normal tape does when it gets old. 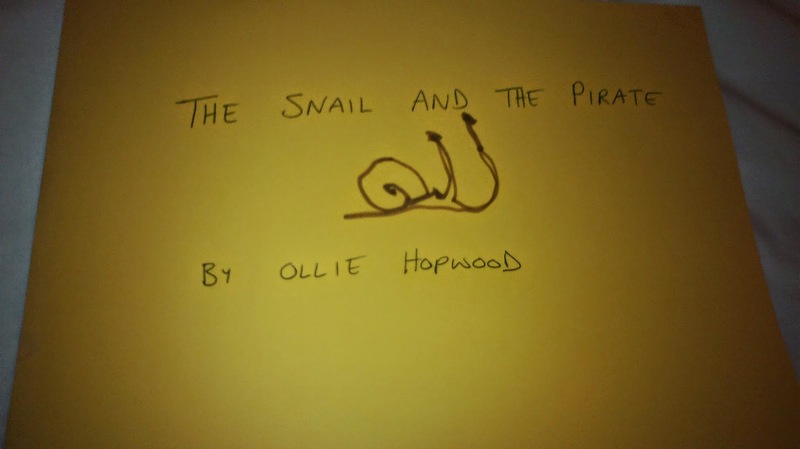 Ollie then added the drawing of the snail to the title page and wrote his name at the bottom of the story page. He is immensely proud of his book. We have to read it at least twice at bedtime. He wants to add more pages to the story, so it will be interesting to see how it develops over time. Most of the trick of getting children to read and write is helping them to value it so that they want to learn. 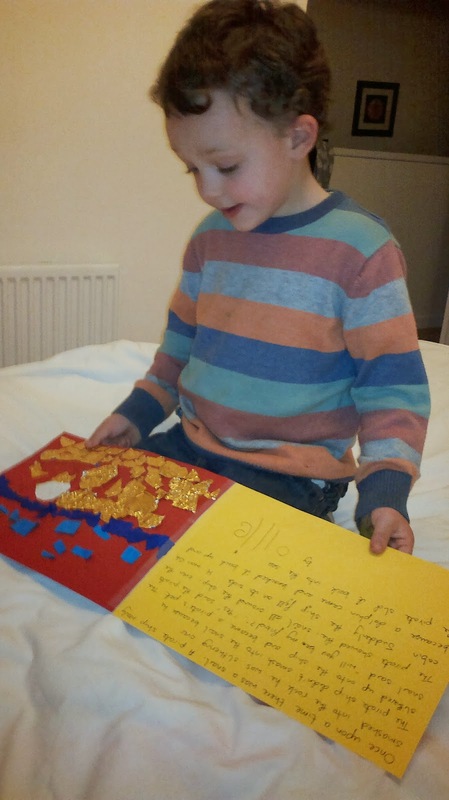 You can do this by showing them how much you value reading and writing by making sure they see you enjoying reading and writing, and by showing that you value their blossoming literacy by displaying their pictures and attempts at writing and just generally letting them know how proud of them you are. I like activities like this though because you are making a direct link to what literacy is for - communicating thoughts - in a way that you will never achieve through flashcards or copying from worksheets.